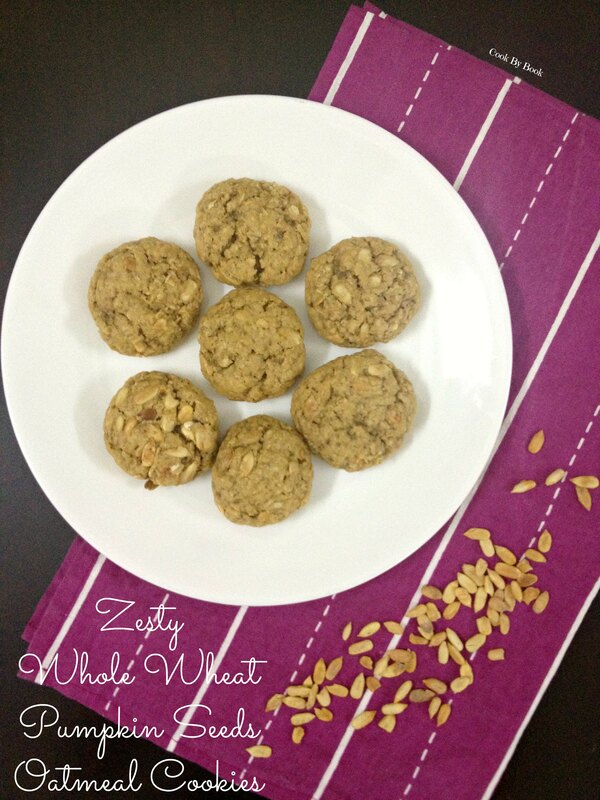 These oatmeal cookies are made with whole wheat flour. Magic ingredient involved – Cornstarch! It has been added to the cookies which keeps them thick and puffed after baking. Each bite is orange-y and filled with pumpkin seeds. Do not skip the dough chilling step. It is absolutely mandatory for the ease of handling dough. Another important tip is to not over-crowd the cookie sheet. Arrange only 9 dough-balls for each batch. 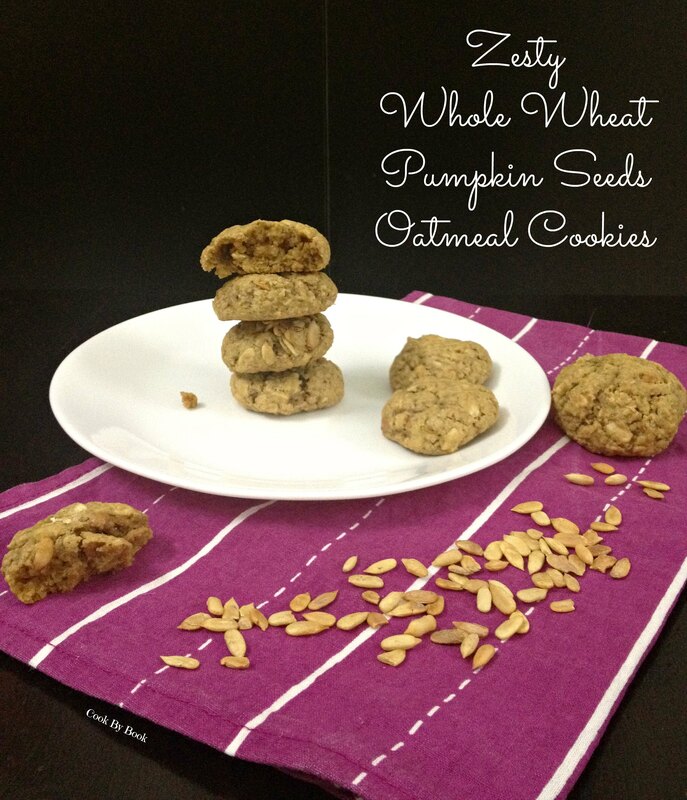 In a medium bowl, whisk together flour, oats, cornstarch, baking soda and salt. Set aside. In a bowl of your electric mixer, beat the butter until soft. Add both sugars and beat until light and fluffy on a medium speed for about 1-2 minute. Whisk in orange zest. Add egg and continue to beat for another minute. Whisk in vanilla and orange extract. Carefully add dry ingredients to the bowl and beat at slow speed until no flour pockets remain. Add 2 Tbsp milk to bring the dough together. Fold in the pumpkin seeds to the dough. Let the dough chill in the refrigerator for 30 minutes to 1 hour. Do not skip this step as the dough is unmanageable at the room temperature. Preheat the oven at 180ºC / 350ºF. Line the cookie sheet with parchment paper. Take 1 Tbsp of dough and form it into a ball between your palms. Arrange the dough balls on cookie sheet 2-inch apart from each other and bake for 8-9 minutes. Do not overbake. The sides should be golden and center may seem soft but it will set once cooled. Let the cookies cool on a cookie sheet for 5 minutes and then transfer it to a cooling rack. Once cooled completely, transfer it to an airtight container. Cookies keep fresh for about 7 days at room temperature. Thank you for the wonderful cookies. They were absolutely delicious. I am sorry my cookies didn’t get to you, and have just come back undelivered. Will mail some again once you return! Happy holidays to Riddhi. This item looks so beautiful. If someone can share this with me then I’ll happily take it. Very lovely.